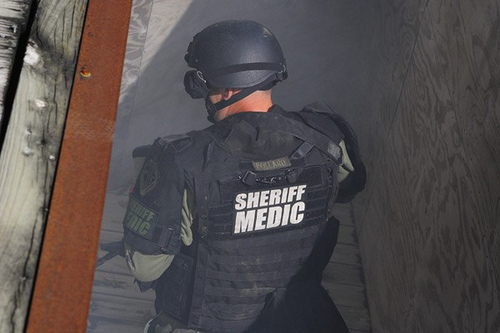 The Broward Sheriff SWAT Team endured a five hour standoff with a Coral Springs man who was suspected of robbing the Seminole Coconut Creek Casino in December 2009. Dominic Zibuda was the man in question and the standoff began when the police got a tip of where Zibuda was. Zibuda was suspected of robbing a poker room cashier of thousands of dollars last year and police were told he was hiding in a duplex in Oakland Park. The SWAT Team arrived at the house and surrounded the area when two men and a woman inside the home came out. They were questioned by police and then released. Zibuda refused to come out and fired several shots one of which broke a front window, thankfully no one was hit. Deputies closed off the street near the home and told everyone to stay in their home. The SWAT Team entered the residence at around 9:30pm and found ZibudaÃ¢â‚¬â„¢s body. The final shot was Zibuda committing suicide. After police entered the home they identified that Zibuda was in fact the man suspected in the poker robbery. The Seminole Police used surveillance tapes from the casino to determine the identity of the poker robber.